When you're starting on your carbon cutting journey, it's worth getting your head around the idea of a 'carbon footprint'. This is the chunk of carbon emissions that a particular individual or organisation is responsible for, usually expressed as a number of tonnes per year – a higher number means a bigger footprint. That number's influenced by all sorts of factors, from big-picture stuff like how your country generates its electricity, right down to the number of cat videos you watch on YouTube. 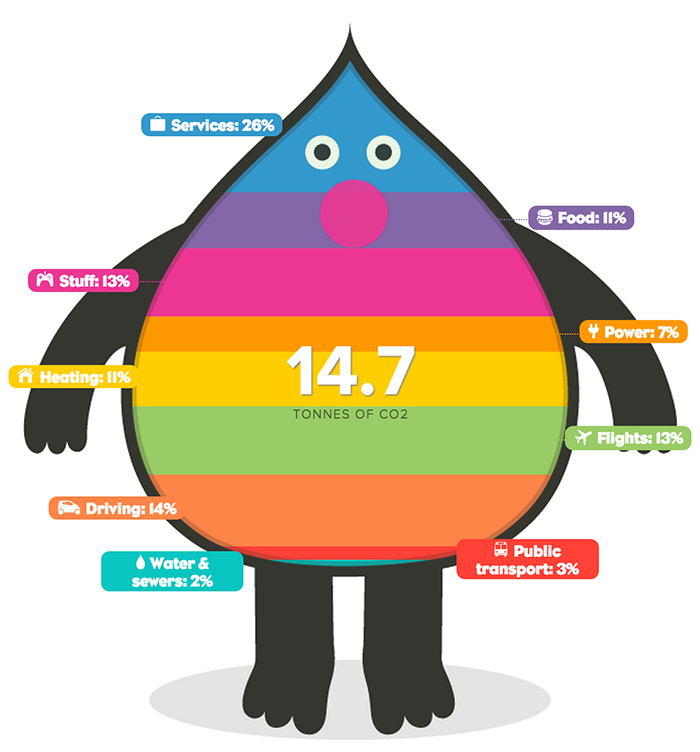 Here's an overview of a typical UK carbon footprint. One important point before we break this down: things like this can only ever be estimates based on averages, so take the numbers with a pinch of salt. And unless you find this stuff inherently interesting, you really don't need to obsess over the details. Knowing how the different areas compare can help you focus your effort where it'll make the most difference, but it's about getting a general sense of proportion, rather than calculating everything to seven decimal places. Learn enough to help you take action, then roll your sleeves up and crack on! So with that out of the way, let's take a look at those different segments in size order. By far the biggest segment is the mysterious 'services'. This refers to the various things that other people do on our behalf: running the government, building new houses, cooking restaurant meals, and so on. You might not be able to directly influence this stuff like you could with driving, but thinking about it as part of your personal footprint is a helpful reminder of why the 'good citizen' side of carbon cutting, where you team up with others to change things on a larger scale, is so important. Most people can easily get their head around cars' contribution to climate change: there's loads of them around, and they have a little pipe at the back where the climate change comes out. Depending on how your life is set up, cutting down on driving can be an easy win (I'm looking at you, single city-dwellers) or totally impractical (if you live in the middle of nowhere with four kids and a Doberman, for example). But even where bikes and buses aren't an option, you can make a big difference by adopting a some simple fuel-saving techniques: accelerate gently, slow down gradually, shift up early and stick to the speed limit. Experts call this 'hypermiling' or 'not driving like an arse'. Ah, planes: so useful, so enabling. And yet. Deciding whether or not to take a flight is up there with your choice of house in the 'single decision with the biggest carbon impact' stakes. So if you fly regularly (and it's worth pointing out that most people don't), that's probably going to be the single biggest chunk of your carbon footprint. Where does that leave us? Discovering new landscapes and cultures is one of life's great pleasures, and no-one's demanding that you skip your American sister's wedding or whatever. But when Summer holiday time comes round, don't forget that the UK's full of astonishingly beautiful and endlessly interesting places. And when you widen the net to the train-able bits of Europe, the options are endless! This is another big one that doesn't get much attention. 'Stuff' refers to the physical goods we buy: computers, furniture, books, clothes, that life-size cardboard cutout of Zayn from One Direction, and so on. We don't tend to think of things like clothes or books as having their own carbon footprint, but it's obvious when you think about it: all those mines, factories and delivery trucks have to run on something. Don't buy stuff you don't want or need. When you do buy something, get the best-quality version you can afford and look after it. Buy second hand where possible. This one's actually pretty easy: the highest carbon foods are red meat and hard cheese, so swapping those out – especially in dishes you cook regularly – will make a big difference. 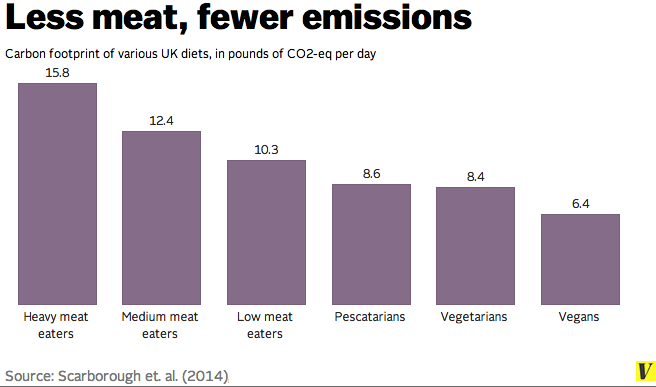 Here's how different diets can affect your carbon footprint. Only producing as much heat as you need (radiators off in empty rooms, nudging the thermostat down a bit, etc). Making the most of the heat you do produce (insulation, draughtbusting, not having your sofa right up against the radiator etc). And for the more ambitious, generating heat from cleaner sources (solar thermal panels, heat pumps, wood burners etc). Although renewables catching up fast, most of our grid electricity comes from gas or coal-fired power stations. People generally get that electricity has a carbon footprint, but there's plenty of confusion about the relative impact of different appliances. So while unplugging chargers or changing lightbulbs get a lot of attention, you might get just as much benefit from using your oven more efficiently, or buying a fridge that's the right size for your needs. If it produces a lot of heat or movement, it's probably using a lot of power. So kettles, ovens, hairdryers, hoovers, washing machines etc need loads of electricity to work. Start with the stuff you use the most. Even if it's not on the list above, anything that's running for hours a day will rack up the savings really quickly if you can use it more efficiently. If you don't drive this number will be bigger, but almost certainly still less than if you were taking the same journeys by car. Savings here are mostly indirect, either from cleaner vehicle technology (time to put on your citizen hat again!) or having your life set up in such a way (eg working from home or living close to places you visit regularly) that you don't need to take regular long journeys. This pretty much does what it says on the tin, and isn't worth worrying about too much. Having water separated out from other services does point to one interesting thing though: most of the carbon impact from water comes from heating it, so wasting hot water is a much bigger deal, climate wise, than cold. That doesn't make it a good idea to leave the hosepipe on while you're on holiday, but it's a good reminder that general 'care for the planet' type habits don't always give much bang for your buck, climate-wise (see also: plastic carrier bags). Older PostPension funds are quitting fossil fuels. Could they invest in community energy?